1921 Ladies Home Journal Tetlow's Pussywillow Face Powder Magazine Advertisement. Refreshing as all outdoors, Soft and Soothing, Sifted through Silk. Henry Tetlow Co., Philadelphia, Pennsylvania. Ad is 14" high and 10" across. Very good condition, Slight wear and small tears at edges, suitable for framing. 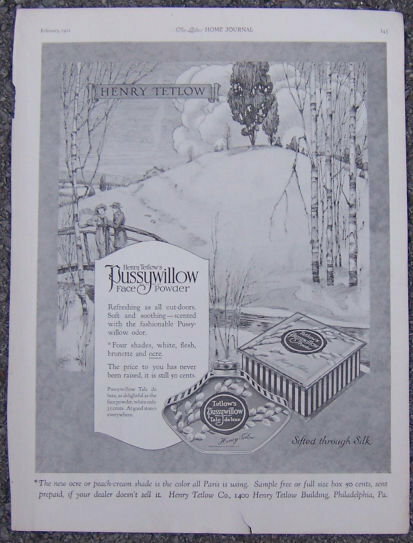 Items Similar To "Tetlow's Pussywillow Face Powder 1921 Advertisment"